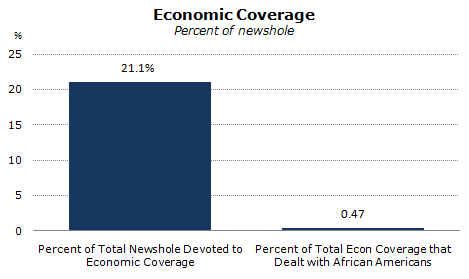 In all, less than 1% of the coverage of the economic crisis was related in some significant way to African Americans. This came despite the media devoting more attention to the economy than any other story during the time period studied. From February 2009 to February 2010, the economic crisis accounted for 21.1% of all news coverage. What coverage there was tended to be bleak. Fully 51.4% of the economic coverage that mentioned African Americans was about unemployment and often contrasted unemployment of African Americans and whites. The New York Times on December 1, 2009, for example, ran an article about the growth of the race gap in hiring and employment during the recession, even among those with college degrees. The article focused on several African Americans looking for jobs, including a 37-year old, Barry Jabbar Sykes, who has a degree from the historically black Morehouse College. Sykes uses the first name “Barry” on job applications even though he has gone by Jabbar his whole life because he thinks it will give him a leg up in hiring. “Barry sounds like I could be from Ireland,” Sykes said. Other stories were about African Americans who had sub-prime mortgages or who confronted discrimination in the mortgage process and the NAACP suing Wells Fargo and HSBC for institutionalism racism. The small portion of health care stories that included a racial component most often drew attention to disparities in coverage between the races and between the wealthy and the poor. Only 0.6% of overall healthcare coverage had an African American angle, and 4.1% of the African American newshole was devoted to healthcare. A July 20, 2009 Anderson Cooper 360 package investigated racism in the health care industry, bringing to light “two systems” in New York City: those privately insured compared with those on Medicaid. There was a focus on how blacks faced this unfairness disproportionately to whites. In addition, a June 9, 2009 ABC News headline radio story covered black, Latino and Asian lawmakers seeking to call attention to disparities in medical treatment in poor areas.